Nick Brandt is a photographer who photographs exclusively in Africa, one of his goals being to record a last testament to the wild animals and places there before they are destroyed by the hands of man. He began as a videographer of music videos for such stars as Michael Jackson, Moby, and Jewel. He was trained in England in painting and film. It was video directing that eventually led him to his current career as an African wildlife photographer. In 1995, while filming in Africa, Brandt became fascinated and fell in love with the wild animals and places. He wanted to capture his feelings about the places and animals but was impossible on video, so he started doing it on photography. Nick no longer directs, he is devoting himself full time to his fine art photography. Brandt’s pictures of African wildlife are daring: he does not use a telephoto lens, but rather ventures up close to these untamed and dangerous animals. His photos are not purely documentary. Brandt wishes to translate the features of the animals, as well as their spirits, into the photograph. He is an animal rights activist and a nature preservationist. He started a non-profit organization called the Big Life Foundation, which is dedicated to the conservation of Africa's wildlife and ecosystems. Relying on a grass roots effort, the aim of Big Life Foundation is not only to apprehend poachers but to protect the entire ecosystem, drawing on community collaboration to support conservation, which in turn can support and sustain the community. Now they have 300 rangers, working to protect the animals in the area. Brandt has had multiple solo gallery and museum shows around the world, including in New York, London, Berlin, Paris and Los Angeles. Born and raised in England, he now lives in the southern Californian mountains. “On This Earth, A Shadow Falls, Across the Ravaged Land” is a profoundly iconic project started in 2000. 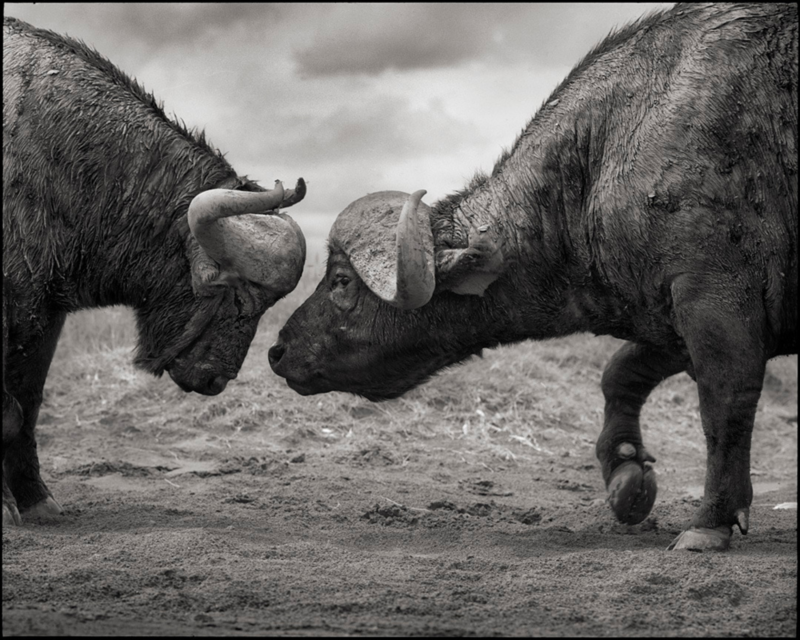 The emphasis has generally been on capturing the drama of wild animals IN ACTION, as opposed to simply animals in the state of being.These series of iconic wild animals captured in East Africa are an elegy to the world that is steadily, tragically vanishing. I had a vision in mind: I wanted to create an elegy, a likely last testament to an extraordinary, beautiful natural world and its denizens that is rapidly disappearing before our eyes. I wanted to show these animals as individual spirits, sentient creatures equally as worthy of life as us. His ambitious photographic project: a trilogy of books to memorialize the vanishing natural grandeur of East Africa puts forth is that the animals he has photographed are disappearing as they are being both aggressively poached or crowded out by a growing population. 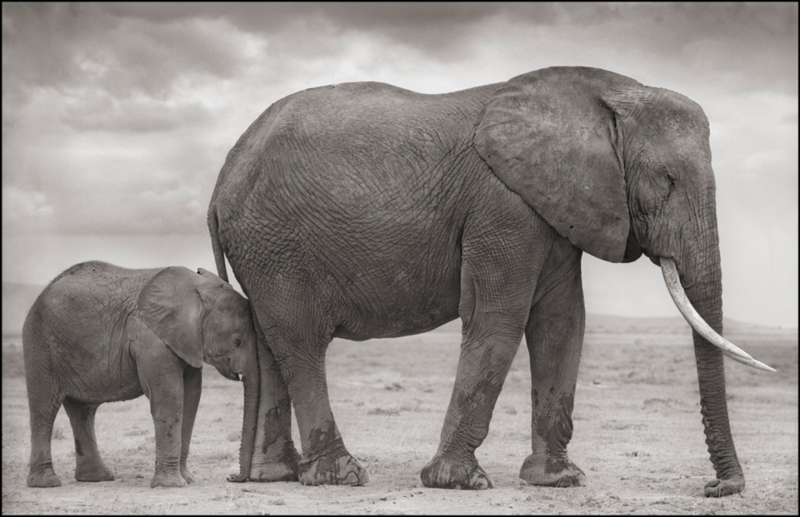 Nick Brandt depicts the animals of East Africa with an intimacy and artistry unmatched by other photographers who choose wildlife as their subject. He creates these majestic sepia and blue-tone photos contrasting moments of quintessential stillness with bursts of dramatic action by engaging with these creatures on an exceptionally intimate level, without the customary use of a telephoto lens. Evocative of classical art, from dignified portraits to sweeping natural tableaux, Brandt's images artfully and simply capture animals in their natural states of being. With a foreword by Alice Sebold and an introduction by Jane Goodall, On This Earth is a gorgeous portfolio of some of the last wild animals and a heartfelt elegy to a vanishing world. The first two volumes of the trilogy were recently combined and published together as “On This Earth, A Shadow Falls,” containing the 90 best photos selected from the first two books. Dedicated to the billions of animals, past, present and future, that have died without reason at the hands of man, the book is the culmination of more than a decade of work. Over those years the pulations of elephants, lions, and other large mammals have fallen precipitously, while Brandt’s vision and his attachment to his subjects have intensified. His images of animals resonate with a simple idea: That the sentient creatures in his portraits are not so different from us and have an equal right to live. 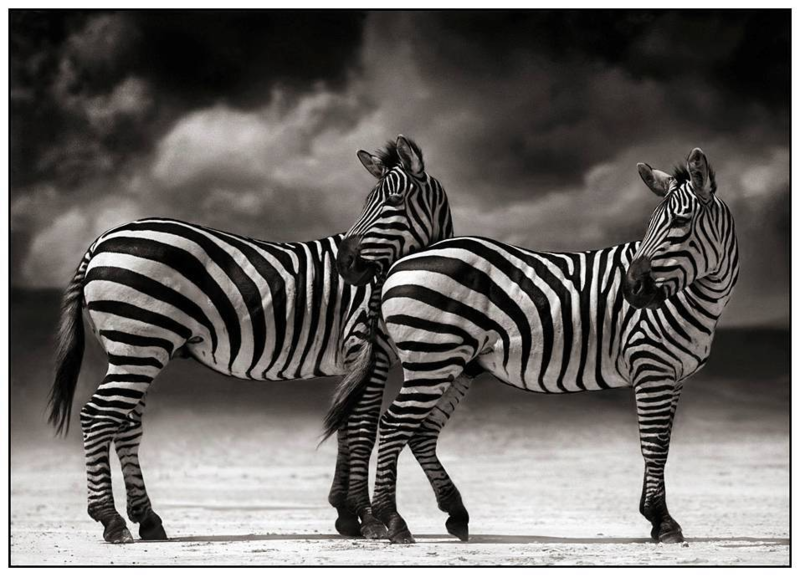 A darker theme that reflects what is going in this series, are photos of animal trophies that were killed by hunters. In addition to his starkly powerful animal portraits, Brandt explores new themes, as humans make an appearance in his work for the first time in the form of the rangers, whose work it is to protect the animals. He also “repopulates” the epic landscape with remains of animals that he finds or introduces, including hunters’ trophy heads looking out over the lands where they once roamed, and preserved birds and bats calcified in soda lakes, appearing to pose for their portraits, alive again in death. These powerful images evoke the feeling of a staggering loss as well as an intimacy and sentience felt between the animals. 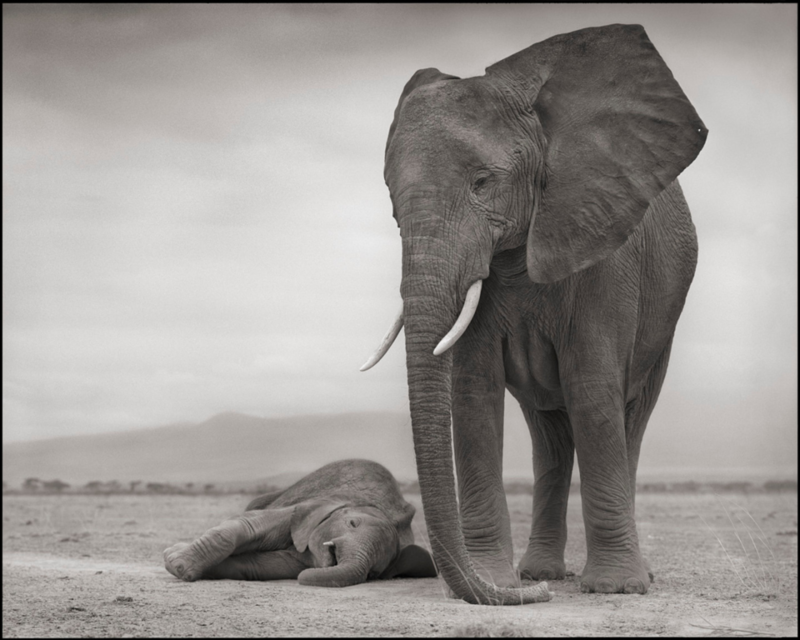 Nick Brandt decided to end this trilogy with a photograph called elephant footprints. He hopes that mankind will allow the elephants to cross these lands for the generations to come. 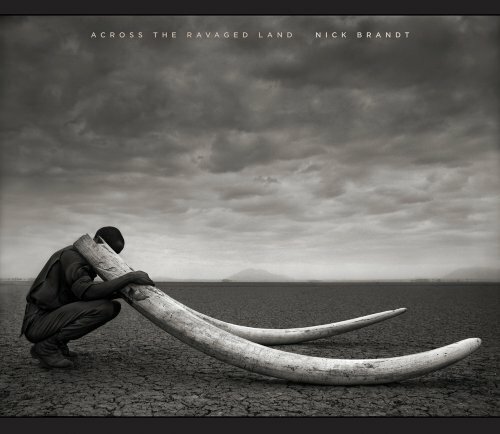 Nick Brandt final installment of the trilogy, “Across the Ravaged Land”, is being presented in a noticeably darker tone around the world. The ongoing efforts to document a rapidly disappearing world visualized through the breathtaking monumentality of Africa’s wildlife and its current threats can be discovered in full sized printed images at: HASTED KRAEUTLER GALLERY, New York; FAHEY/KLEIN GALLERY, Los Angeles; PHOTOEYE GALLERY, Santa Fe; SOURCE PHOTOGRAPHICA, Melbourne; A GALERIE, Paris; CAMERAWORK GALLERY, Berlin; ATLAS GALLERY, London and YOUNG GALLERY, Brussels.